The Pettyjohn Crush is a studio-grade compressor in our Foundry Series single pedal format that is powered by a unique Discrete Voltage Controlled Amplifier (VCA). After bringing the first Discrete Opamp based pedal to the market with the original PreDrive in 2014, Pettyjohn are please to bring the first Discrete VCA based guitar pedal to market! The CRUSH delivers highly musical compression in the spirit of beloved Discrete VCA compressors, such as those found in legendary British consoles, mastering buss compressors and vintage rack gear, but tailored specifically for use with any guitar or bass signals. Using a modern Discrete VCA in our design has its greatest advantage in that it is extremely transparent even at large gain reduction amounts. Compression can be a bit of a mysterious effect to dial in so we tried to make our controls easy to navigate while having enough depth to achieve several unique compression styles easily with one small box. Furthermore, the CRUSH has several useful tools for shaping your tone beyond traditional compression effects. These features include a highly versatile TILT EQ circuit, a CLEAN MIX knob that mixes in a sweet, clean pre-amped signal and generous helping of make up gain on tap that can handle most boosting duties. Once you find your sweet spot, it may become a pedal you cant live without! Delivers highly musical compression in the spirit of beloved Discrete VCA compressors (such as those found in legendary British consoles). Tailored specifically for use with any guitar or bass signals. Extremely transparent even at large gain reduction amounts. Several useful tools for shaping your tone beyond traditional compression. Versatile TILT EQ circuit, Clean Mix knob and Gain. 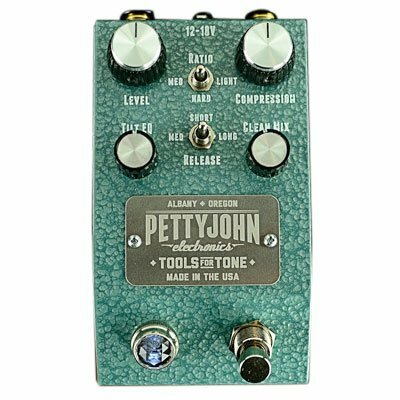 If you have any questions about this product by Pettyjohn, contact us by completing and submitting the form below. If you are looking for a specif part number, please include it with your message.